Why should you choose to use utopia furniture? The Utopia Furniture is the UK’s leading manufacturer for bathrooms. They are reliable and have a large variety of products which are of high quality. So why not? There large furniture range is all designed and produced in the UK and a full guarantee is provided on all their products. This will settle the nerves if you’re feeling a little wary. A huge factor to buying your perfect bathroom is being comfortable in the knowledge that you have comprehensive manufacturers guarantees. 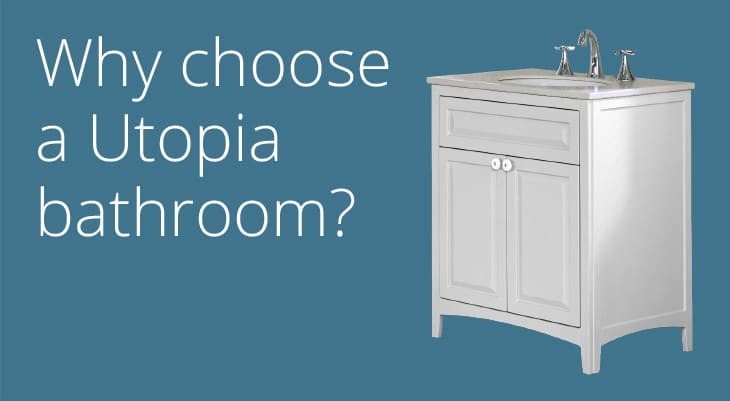 For over 25, Utopia have been designing and manufacturing high quality reliable bathroom suites, individual bathroom furniture, worktops, mirrors and bathroom accessories in the UK. As one of their specialist retailers we supply the full variety of products from Utopia from our Leeds Bathroom Showroom. They also supply a very large variety of shower screens, baths, lighting, tiles, taps and accessories. All these different products are designed to complement and enhance the overall look and ambiance of your stunning unique, personalised and original bathroom. This will also add that extra special finishing touch to complete the whole look.